Associate Professor Kayhan ostovar and students at "halfway point" on the annual cleanup. Since 2008 Rocky Mountain College has conducted an annual river cleanup float from Duck Creek Bridge to Coulson Park. Many organizations in the community support this project with donations and volunteers. Click here for Billings Gazette coverage of the 2013cleanup. *** UPDATE! 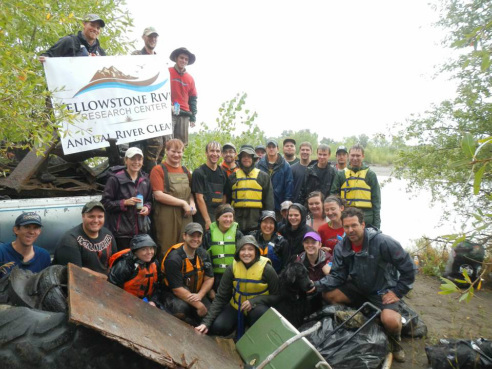 -- The 2012 cleanup featured 27 people and 14 boats. Shore teams included another 15 people. Total haul: 5,600 lbs of metal; 39 tires; 30 bags of trash. *** UPDATE! - Click here to view Billings Gazette coverage of the 2011 cleanup. Osprey caught on webcam bringing in fish. Photo courtesy of Project Osprey, Missoula. Montana Fish Wildlife and Parks, St. Cloud State University and Northwest Energy. Osprey (Pandion haliaetus), are top avian predators of fish and are considered potentially useful contaminant level indicators for aquatic ecosystems as a sentinel species. As a potential sentinel species (that eat many of the same fish species as humans do) osprey may help us understand how industrial development in the Billings area may be impacting water quality. *** UPDATE 7/25/12 --> Click here to view a Billings Gazette article on this project! Click here for video! Example map showing change in shape and area of "Island 1" from 1950-2011. Students in Dr. Luke Ward’s Introduction to Geographic Information Systems (GIS) course are collaborating with Our Montana to conduct a pilot study that uses GIS to identify historical change in publicly-owned, vegetated islands in the Yellowstone River. The project combines digitizing and spatial analysis techniques to map and analyze change in island shape, area, vegetation cover, and land ownership status over time. The results of the study were used to guide the Beartooth Paddlers in a “bioblitz”-style survey of the islands this summer and will eventually be used to support efforts by Our Montana and other agencies to make the entire 690-mile extent of the Yellowstone River accessible to floaters. The project will also identify long-term ecological monitoring sites on each island. *** UPDATE! -- Click here to view an update on this project! Children touch a prairie rattlesnake during a presentation by a Bioblitz scientist. Photo - Dave Shumway. BioBlitzes are truly collaborative projects that bring together professional researchers and citizen scientist. During a BioBlitz a catalog is made of the total biodiversity via a species list. Knowing the number and diversity of species in a given area helps us understand the ecosystems that sustain the clean water, air, and healthy soils that we all enjoy. A BioBlitz provides an opportunity to increase the knowledge of a specific area and generate public awareness and interest from scientists, researchers and volunteers. In 2007 the first BioBlitz in Montana was conducted on the Yellowstone River in Billings. Organized by Associate Professor Kayhan Ostovar, in partnership with Audubon, this BioBlitz has led to led to other similar projects in the state. In 2009 we helped Yellowstone Park conduct their first BioBlitz, which received considerable national and even international media attention. In 2011 we worked with the American Prairie Foundation to conduct a BioBlitz on the American Prairie Reserve near the Charles M. Russell National Wildlife Refuge on the Missouri River. The 2012 BioBlitz took place July 6-8 in the Pryors Mountains. More than 80 scientists and students participated, documenting 710 species of plants and animals. *** UPDATE - Click here for a Billings Gazette article on the 2012 Biltz. Starting in 2008 Associate Professor Kayhan Ostovar began long-term ecological monitoring at several sites along the Yellowstone River (Canyon Creek, Spring Creek, Five Mile Creek, Two Moon Park, ExxonMobil Wildlife Habitat Area, and Riverfront Park). In Ostovar's Field Research Techniques in Zoology course, students are trained in species identification and field survey skills. Later in the course, students apply this training to carry out annual surveys along the river. At these sites students conduct timed searches for herpetofauna, seines streams to document fish species diversity and abundance, run trap lines for small mammals, and carry out bird transects and point counts. These studies form the foundation for a better understanding of the impact of invasive species, development and ecosystem change. Starting in 2012 we will be expanding this project and working with Audubon to monitor avian species of concern and look at impacts related to Russian olives (Elaeagnus angustifolia). Bo Walker (RMC), Aron Smethurst, & Tom Lyman prepare to traverse. Lyman lowers the sled. Beginning in 2011, Rocky Mountain College professor Dr. Jennifer Lyman, Tom Lyman (GIS/GPS Specialist for the National Science Foundation) and RMC professor Dr. Luke Ward have been working with RMC students, the Absaroka Beartooth Wilderness Foundation, the United States Forest Service to gather data about change in mass of ice stored in two glaciers in the Beartooth Mountains: Rearguard Glacier and Grasshopper Glacier. The project uses GPS technology to gather high accuracy elevation data for areas on or near glaciers. The resulting data will be used to improve stereographic imagery-based models for calculating change in glacier mass (loss/gain) over time. In 2012, to minimize risks that the steep icy glacial slopes posed to the team, the GPS receiver, a laptop computer, a GPS-enabled iPad, and a power supply were attached to a plastic sled and then lowered up to 800 feet down the headwalls of the glaciers (as shown in the photo above).